Legal Executives in law firms enjoy professional status and may be given certain limited rights of audience in accordance with the Court’s Practice Direction to represent lay client. 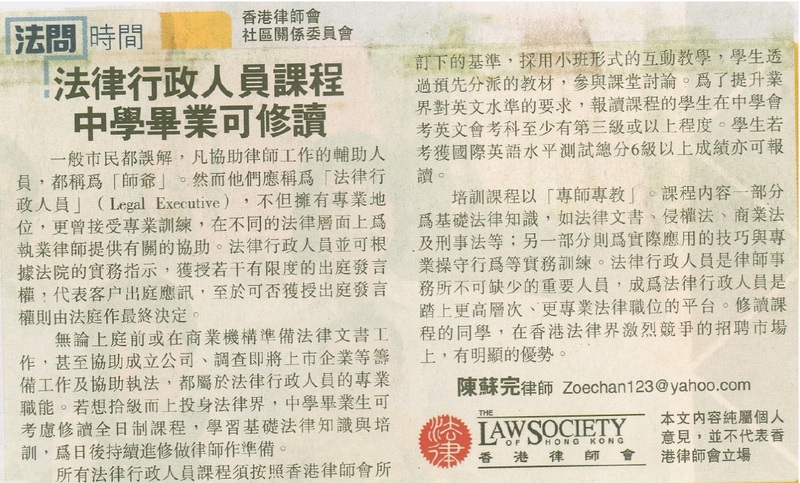 To use the title "Legal Executive (LE)", graduates of this programme must meet the new Benchmarks standard of The Law Society of Hong Kong (HKLS). Workshops focused on law-related work and skill-based tasks. The Higher Diploma for Legal Executives (“HDLE”) is recognised by the Institute of Paralegals, the UK professional body for paralegals which sets national competency standards for paralegals and others. HDLE graduates can apply for Paper F4 exemption from the Association of Chartered Certificate Accountants (ACCA). Job opportunities can be found in both public and private business sectors, such as solicitor’s firms, barristers’ chambers, law enforcement bodies and government. overall score of 6 in IELTS (International English Language Testing System).